REVIEW: Transform your photos into art in the style of an Old Master with this powerful software. Fun and useful tool for generating interesting images and learning about painting techniques. This Windows software takes your photos and turns them into works of art, digitally repainting them in the style of artists such as Van Gogh, Monet and Cézanne. However, what makes this more than just a novelty is its educational value. As it 'paints' each masterpiece on screen, you see text pop up that explains exactly what art techniques, brushstrokes, etc, it's using. And when the painting is finished, you can try out some of these techniques yourself, and edit it with the in-built tools (which are sophisticated enough to easily help you develop your painting). 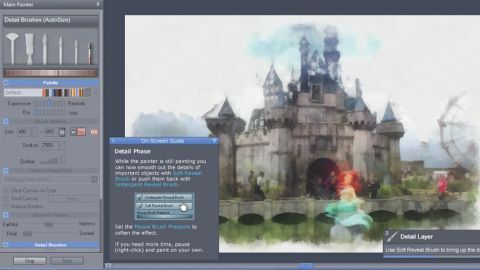 While the interface isn't immediately easy to use, in general, this software could be a nice introduction for anyone wishing to get started with digital painting, learn about the great masters, or both. Plus there's a free trial, so you can try before you buy. Dynamic Auto Painter 5 costs $99 and is available from Media Chance. This article originally appeared in Paint and Draw issue 02; buy it here.